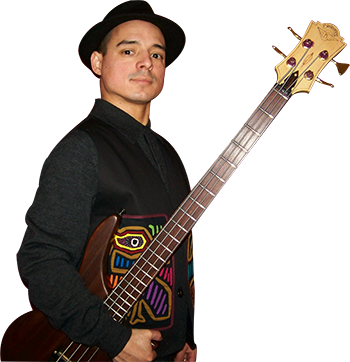 Originally from Medellin, Colombia, Andrés Domínguez took up the bass at age 16 while studying under the direction of bassist Jairo Gomez (Roberto Lopez Project) at his home town. Later, he enrolled at McNally Smith College of Music in Minneapolis to further improve his abilities where he was fortunate to learn under the direction of Terry Burns and Anthony Cox. Pursuing his love for the instrument Andrés would later enroll at Berklee College of Music in Boston where he further expanded his approach to the instrument by taking classes from Oscar Stagnaro, Fernando Huergo and Bruce Gertz. Focused on his goal he graduated in 2001. He has played extensively since arriving to New England and his musical knowledge of different styles has giving him the opportunity to join in a variety of ensembles in a professional setting. Andrés’ latest effort “Observance” was finished in 2010.